Also solved is a problem with distortions in videos and Live Photos shot on the phone, Apple said in release notes. 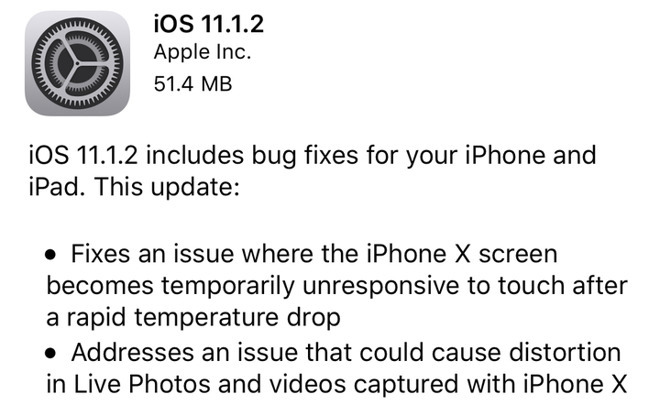 The update should be available over-the-air through the Software Update menu in the iOS Settings app, or else by connecting a device to iTunes on a Mac or Windows PC. Just last week Apple released iOS 11.1.1, fixing the infamous "i" autocorrect bug, as well as a problem with "Hey Siri." The company remains at work on a bigger point release, iOS 11.2, which will enable 7.5W wireless charging on the iPhone 8 and X, and launch the long-awaited Apple Pay Cash, enabling direct money transfers through Messages.